Your hip joints are engaged in nearly every motion. So when your hip hurts, everything suffers. Working, walking, playing, driving, and even sitting can be a challenge in endurance. Our job is two-fold – to relieve your pain and to get you back to your daily routine. We make sure that our patients experience high quality, state-of-the-art care for labral tears, soft tissue injuries, and bony problems. We utilize advanced technologies and surgical techniques ideal for rapid recovery and long lasting joint function. How do I know if I need total hip replacement surgery? If you have the later stages of osteoarthritis, a severe hip fracture, your hip joint hurts when you rest at night, or your hip is severely deformed, our surgeons may recommend total hip replacement surgery (arthroplasty). You will get a two-piece ball and socket replacement for your hip joint. This will cure your pain and improve your ability to walk. You may need crutches or a walker for a while after surgery. Rehabilitation is important to restore your hip’s flexibility and work your muscles back into shape. 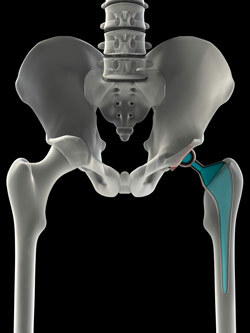 Hip replacement surgery has become one of the most important orthopedic surgical techniques of this century. Since then, improvements and advances in joint replacement surgery and technology have greatly increased the effectiveness of hip surgery. More than 332,000 total hip replacements are performed each year in the United States. If your hip has been damaged by arthritis, a fracture, or other conditions, common activities such as walking or getting in and out of a chair may be painful and difficult. Resting and sitting may even feel uncomfortable. If medications, changes in your everyday activities, and the use of walking aids such as a cane are not helpful, you may want to consider hip surgery. You can have a partial hip replacement, total hip replacement surgery, or if only one part of the joint is damaged, a partial hip replacement may be recommended. If the whole joint is damaged, an artificial joint (total hip replacement surgery) can relieve your pain and help you get back to enjoying normal, everyday activities. Hip replacement surgery by experienced orthopedic surgeons is highly successful in relieving pain and restoring movement. However, the ongoing problems with wear and tear may eventually need additional surgery, including replacing the prosthesis (hip revision surgery). Men and patients who weigh more than 165 pounds have higher rates of failure. The chance of a hip replacement lasting 20 years is about 80 percent. How long will I need to stay in the hospital following hip replacement surgery? Plan for a few days’ stay in the hospital. After total hip replacement surgery you will feel pain in your hip, so you will receive pain medication to make you as comfortable as possible. To avoid lung congestion after hip surgery, you will be asked to breathe deeply and cough frequently. To protect your hip during early recovery, a positioning splint, such as a V-shaped pillow placed between your legs, may be used. Begin walking and light activity the day after your surgery. Most hip replacement patients stand and walk with the help of a walking support and a physical therapist the day after surgery. The physical therapist will teach you specific exercises to strengthen your hip and restore movement for walking and other normal daily activities.